The first phonograph cylinders were manufactured in 1888, followed by Edison's foundation of the Edison Phonograph Company in the same year. 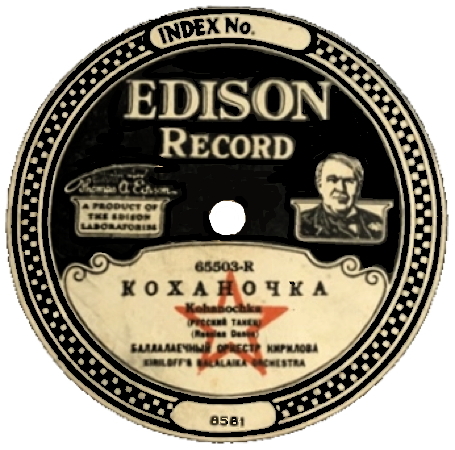 In October 1912 the Edison Diamond Disc Record was introduced. The thick Edison Discs recorded the sound vertically in the groove at a rate of 150 grooves-per-inch (GPI) rather than the typical laterally-cut groove of around 100 GPI, which gave 10-inch Edison discs a longer playing time (up to five minutes) than laterals and could only be played to their full advantage on Edison Diamond Disc Phonographs. This combination produced audio fidelity superior to any other home record playing system of the time. 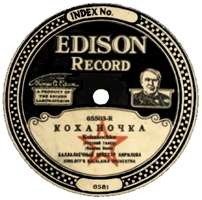 Edison Records closed down in October of 1929. 65503-R  Kohanochka. A traditional Russian folk dance. Kiriloff's Balalaika Orchestra. Circa 1920s.